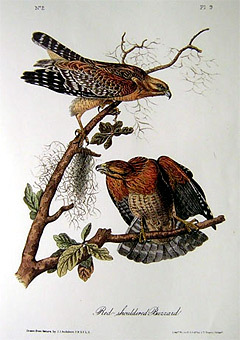 Pictured (right) is John J Audubon’s illustration of the Red-shouldered Buzzard, today commonly referred to as the Red-Shouldered Hawk. This hand-colored lithograph is Plate #9 from the Octavo Edition of Birds of America – created from 1840 to 1844. “The Red-shouldered Hawk, although dispersed over the greater part of the United States, is rarely observed in the Middle Districts, where, on the contrary, the Winter Falcon usually makes its appearance from the north, at the approach of every autumn, and is of more common occurrence. Kentucky, Tennessee, and other Western States, with the most Southern Districts of our Union, are apparently best adapted for the constant residence of the Red-shouldered Hawk, as in all these latter districts it is met with in greater numbers than in any other. This bird is one of the most noisy of its genus, during spring especially, when it would be difficult to approach the skirts of woods bordering a large plantation without hearing its discordant shrill notes, ka-hee, ka-hee, as it is seen sailing in rapid circles at a very great elevation. Its ordinary flight is even and protracted, excepting when it is describing the circles just mentioned, when it often dives and gambols. It is a more general inhabitant of the woods than most of our other species, particularly during the summer, and in autumn and winter; now and then only, in early spring, shewing itself in the open grounds, and about the vicinity of small lakes, for the purpose of securing Red-winged Starlings and wounded Ducks. The interior of woods seems, as I have said, the fittest haunts for the Red-shouldered Hawk. He sails through them a few yards above the ground, and suddenly alights on the low branch of a tree, or the top of a dead stump, from which he silently watches, in an erect posture, for the appearance of squirrels, upon which he pounces directly and kills them in an instant, afterwards devouring them on the ground. If accidentally discovered, he essays to remove the squirrel, but finding this difficult, he drags it partly through the air and partly along the ground, to some short distance, until he conceives himself out of sight of the intruder, when he again commences feeding. The eating of a whole squirrel, which this bird often devours at one meal, so gorges it, that I have seen it in this state almost unable to fly, and with such an extraordinary protuberance on its breast as seemed very unnatural, and very injurious to the beauty of form which the bird usually displays. On all occasions, such as I have described, when the bird is so gorged, it is approached with the greatest ease. On the contrary, when it is in want of food, it requires the greatest caution to get within shooting distance of it. At the approach of spring, this species begins to pair, and its flight is accompanied with many circlings and zigzag motions, during which it emits its shrill cries. The male is particularly noisy at this time. He gives chase to all other Hawks, returns to the branch on which its mate has chanced to perch, and caresses her. This happens about the beginning of March. The spot adapted for a nest is already fixed upon, and the fabric is half finished. The top of a tall tree appears to be preferred by this Hawk, as I have found its nest more commonly placed there, not far from the edges of woods bordering plantations. The nest is seated in the forks of a large branch, towards its extremity, and is as bulky as that of the Common Crow. It is formed externally of dry sticks and Spanish moss, and is lined with withered grass and fibrous roots of different sorts, arranged in a circular manner. The female usually lays four eggs, sometimes five. They are of a broad oval form, granulated all over, pale blue, faintly blotched with brownish-red at the smaller end. When one ascends to the nest, which, by the way, is not always an easy matter, as some of our trees are not only very smooth, but frequently without any boughs to a considerable distance from the ground, as well as of rather large size, the female bird, if she happens to be sitting, flies off silently and alights on a neighbouring tree, to wait the result. But, should the male, who supplies her with food, and assists in incubation, be there, or make his appearance, he immediately sets up a hue and cry, and plunges towards the assailant with such violence as to astonish him. When, on several occasions, I have had the tree on which the nest was placed cut down, I have observed the same pair, a few days after, build another nest on a tree not far distant from the spot in which the first one had been. The mutual attachment of the male and the female continues during life. They usually hunt in pairs during the whole year; and although they build a new nest every spring, they are fond of resorting to the same parts of the woods for that purpose. I knew the pair represented in the Plate for three years, and saw their nest each spring placed within a few hundred yards of the spot in which that of the preceding year was. The young remain in the nest until fully fledged, and are fed by the parents for several weeks after they have taken to wing, but leave them and begin to shift for themselves in about a month, when they disperse and hunt separately until the approach of the succeeding spring, at which time they pair. The young birds acquire the rusty reddish colour of the feathers on the breast and shoulders before they leave the nest. It deepens gradually at the approach of autumn, and by the first spring they completely resemble the old birds. Only one brood is raised each season. Scarcely any difference of size exists between the sexes, the female being merely a little stouter. This Hawk seldom attacks any kind of poultry, and yet frequently pounces on Partridges, Doves, or Wild Pigeons, as well as Red-winged Starlings, and now and then very young rabbits. On one or two occasions I have seen them make their appearance at the report of my gun, and try to rob me of some Blue-winged Teals shot in small ponds. I have never seen them chase any other small birds than those mentioned, or quadrupeds of smaller size than the cotton rat; nor am I aware of their eating frogs, which are the common food of the Winter Falcon. RED-SHOULDERED HAWK, Falco lineatus, Wils. Amer. Orn., vol. vi. p. 86. Young. WINTER FALCON, Falco hyemalis, Wils. Amer. Orn., vol. iv. p. 73. Adult. FALCO HYEMALIS, Bonap. Syn., p. 33. WINTER FALCON or RED-SHOULDERED HAWK, Falco hyemalis, Nutt. Man., vol. i. p. 106. RED-SHOULDERED HAWK, Falco lineatus, Aud. Orn. Biog., vol. i. p. 296; vol. v. p. 380. WINTER HAWK, Falco hyemalis, Aud. Orn. Biog., vol. i. p. 364. Young. Plumage compact, imbricated; feathers of the head and neck narrow towards the tip, of the back broad and rounded; tibial feathers elongated behind. Wings long, third and fourth primaries longest, first short. Bill light blue at the base, bluish-black at the tip; cere, basal margin of the bill, edges of the eyelids, and the feet bright yellow. Iris hazel. Claws black. Head, neck, and back light yellowish-red, longitudinally spotted with dark brown. Tail brownish-black, banded with greyish-white, the tip of the latter colour. Lesser wing-coverts bright yellowish-red, spotted with brown; larger coverts and secondary quills dusky, broadly barred with white; primary quills brownish-black, banded with white, the greater part of their inner webs being of the latter colour. Lower parts of the neck and under wing-coverts light yellowish-red, the former longitudinally lined with blackish; breast reddish-white, marked with transverse yellowish-red spots; abdomen and under tail-coverts reddish-white. Tibial feathers yellowish, transversely barred with dull orange. Length 18 inches; bill along the back 1 1/4, along the gap from the tip of upper mandible 1 1/4; tarsus 2 3/4.